"Uninvited guests soon become smouldering wrecks." Profile: Before the war Windsweeper was head of the Department of Sanitation on Cybertron. He took an almost perverse pride in keeping the streets and subterranean circuit-tubes of his home world clean and in proper working order. He would have violators - "litterbots," as they were called - thrown into prison for infractions as minor as dripping oil in public. In defense of his extreme actions he would say, "A tidy planet is a mighty planet," to his critics. "Leaky-engined litterbot-lovers," he would call them behind their backs. So it is no surprise to anyone who knows him that today he still practices what he used to preach, but this time in the service of the Decepticons. In his air defense role he patrols the skies constantly, shooting down almost anything he sees: insects, birds, wind-blown leaves, kites, Autobots, even other Decepticons if they are not quick enough to identify themselves before he fires. He feels that the sky is his home, and so he has the right to keep it as clean as he wants... in his case, very clean. Among the Transformers, Windsweeper's meticulousness is notorious... as is his maliciousness. 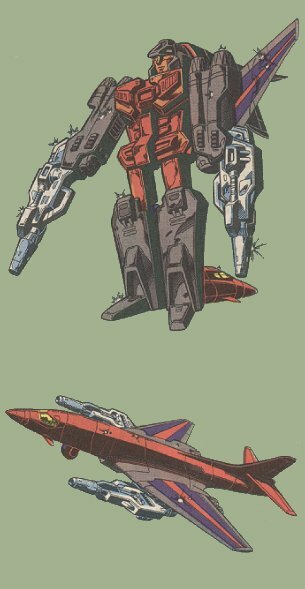 Abilities: In jet mode Windsweeper has the ability to use the high-intensity heat generators in the edges of his wings to melt and cut through solid steel. Most often the steel is contained within the fuselages of enemy aircraft. He has a maximum speed of 2100 miles per hour and a range of 5000 miles. In both robot and jet modes he is also equipped with long-range infra-red scanners, sensitive enough to detect a warm lug nut in a junkyard 20 miles away. He is also armed with two powerful, lock-target, long-range laser cannons. Weaknesses: Windsweeper's natural revulsion to dirt, grime, and all things untidy in general elicits a pronounced unbalanced behavior pattern in him. He loses his ability for clear, logical thinking, he becomes agitated and emotional, and on especially disturbing occasions he has been known to literally blow a fuse. Basically, the best offensive measure to take against Windsweeper is to throw garbage at him.